Edgewater, FL, April 05, 2019 --(PR.com)-- SŌLACE Boats, a premier center console builder, announces the promotion of Todd Albrecht to President. The appointment comes as the company continues to refine tooling, build, and push the launch of their new 345 luxury center console - all of this while setting sights on growing their model lineup. Stephen Dougherty, founder, will remain CEO of SŌLACE, as they work together to further the presence and adoption of the brand in the market. “Bringing Todd aboard this great new endeavor opened countless doors of opportunity, and when combined with his ambition and drive for success, this appointment was the next logical step,” said Stephen Dougherty. With over 22 years of experience in the marine industry, Todd brings a wealth of knowledge to this new role. With a hands-on start in commercial diving to the desk and the field, his experience spans all aspects of the marine industry. An opportunity at Monterrey Boats lead into Jupiter Marine International, where he was VP of Sales until 2016 where he went on to Sea Force IX - his expertise has been a positive impact across the industry for decades. Craving a new challenge, Todd joined SŌLACE to build the foundation of the next great boat brand. As the 345 continues to make waves in the marine industry, SŌLACE and the team are proud to lead the future. Units are expected to be available for sale in June 2019. Further details on features and pricing to follow in the coming weeks. It all started at a very young age for Stephen Dougherty as he experienced total immersion in the ultimate boatbuilding insights. Since then, Stephen Dougherty and his wife Sarah have launched and scaled multiple successful businesses. SŌLACE is the culmination of Stephen’s life’s work, and the business acumen of Sarah. The ultimate design backed by the ultimate company. 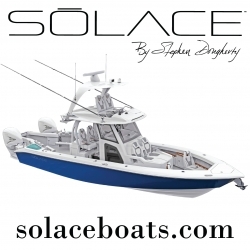 Additional information about SŌLACE Boats is available at solaceboats.com. Follow our news on Facebook at Facebook.com/SolaceBoats and on Instagram at Instagram.com/SOLACEboats. SŌLACE Boats, the logo and other marks are trademarks of SŌLACE Boats and/or SŌLACE Boats affiliated companies. All other marks contained herein are the property of their respective owners.